This resource is for math teachers - and any of you who have children of your own. It seems to be fairly common for 3rd grade to be THE grade for multiplication. My own daughter is in 3rd grade and working on mastering her multiplication facts. We all can agreed students learn very differently and what works for one student may not work for another. Rather than pull your hair out, why not provide multiple ways for your students to practice? I recently read this article from "We are Teachers" written by Elizabeth Mulvahill on Oct. 25, 2017. 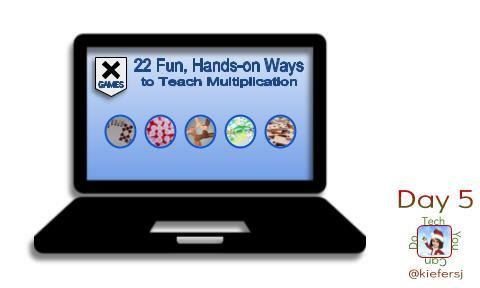 22 Fun, Hands-on Ways to teach Multiplication is amazing! Elizabeth shares 19 non-tech ways for students to practice and an additional 3 that involve tech. One is a link to places to practice facts online, one is for School House Rock videos about multiplication, and finally, multiplication songs. I love that these suggestions involve either materials found in nearly every classroom or they are low-prep for teachers. I can see them being high-impact. I'd even suggest teachers share this article with parents - what a great way to empower parents to better assist their students while at the same time playing games with them?! Personally, I know several teachers I will be sure to share this article with. I also know a certainly cute 3rd grade girl who is related to who will be checking these out. 😉 If you know of teachers who could use these, please be sure to share. If you have kids of your own, please share with them! 💖 this site! Sign up for his email & you receive a math activity just about every day! These are GREAT math "thinking" style activities. An incredible way to mash content with fun while challenging and stretching every brain in the classroom. This one is math, but it really opened my eyes to the possibility for content digital breakouts! Another fantastic math concept site - allows students to make decisions and provide explanations to back up their thinking. A collection of Eric Curts' Google infused math activities & ideas. A collection of Alice Keeler's math activities for teachers and students.